Pioneers in the industry, we offer kinetic air release valves and kinetic air valve from India. Our competency lies in offering our clients an excellent quality range of Kinetic Air Release Valves that are used in air venting or air admission services in water pipelines. Designed using the finest quality raw material and innovative technologies by our skilled professionals, these valves are in adherence with industry norms. The provided valves are strictly tested on variegated parameters in order to ensure their flawlessness. Stainless steel hollow ball with guide stem at bottom of ball. Temper proof main vent with suitable welded cover. Proper bottom seat / guide for large ball allowing sufficient air pressure around the ball. Mechanical lock for automatic air release valve. Oval Shaped small float.- Ensure less spilling of water. 100% sealing at very low pressure. Mechanical Lock- No Extra protection cage. Economical due to its huge advantages. We are instrumental in providing our clients a comprehensive range of Kinetic Air Valve that is used to admit large quantity of air in the pipelines at desired rate while draining the pipeline to prevent water hammer. 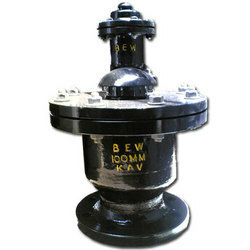 The offered valve is designed using optimum quality raw material and modern technology by our experienced professionals in sync with set industry standards. 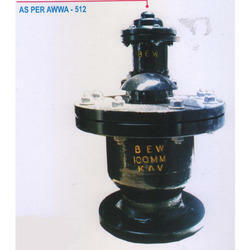 Clients can avail this valve from us at nominal prices. Looking for Kinetic Air Valve ?